Adjustable ergonomic mice are rare. 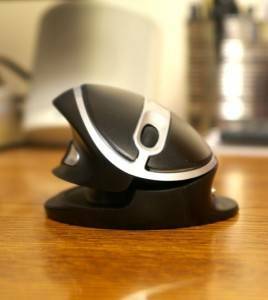 Even Goldtouch – whose motto is “If it isn’t adjustable, it isn’t ergonomic” – puts their logo on a mouse that is in no way adjustable. At best, ergo mice sometimes come in different sizes. Contour, which offers its eponymous rodent in more sizes than some tee shirts, is the classic example of this approach. I was recently contacted to review a new player in the game, a truly adjustable ergonomic mouse called the Oyster – for reasons that become obvious the first time you see it. By clicking open and shut along a track with four stops, the Oyster mouse can instantly change from a standard mouse, to an elevated mouse, to a nearly-vertical mouse, and back. As a bonus, it also comes in both regular and large sizes. Shown here in its near-vertical setting, the Oyster can pivot all way down to flat. 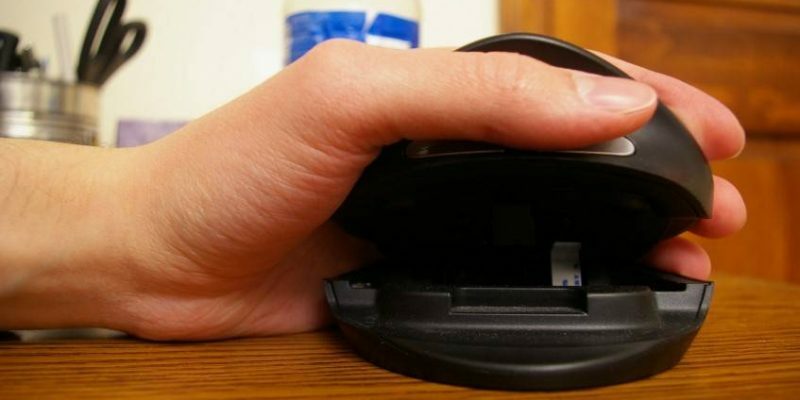 Though some mouse-makers would have you believe otherwise, there seems to be little consensus in the ergonomic world as to which mousing angle is “best.” The vertical “handshake” position is frequently promoted as the most natural way to grip a mouse. Contour Design, however, says this is wrong because you lose the advantage of gravity when clicking side-to-side. The optimal angle, they assert, is actually 17 degrees. Goldtouch goes with a bit over 20 degrees, and so on. The fact is, people are physically different, and one size does not fit all. 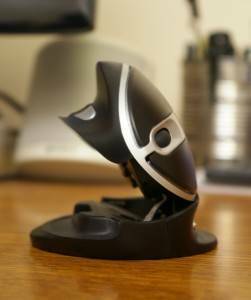 A true vertical mouse suits me perfectly, but others will find that a compromise angle – or even an outright flat mouse – works best for them. Rather than choosing one of these options and promoting it as the best, the Oyster accommodates all of them equally well. To adjust the Oyster, you hold down the mouse base with one hand and lift up the body with the other. Each ratcheting click makes the angle a bit higher, until the final one puts the Oyster in a near-vertical stance. To take it down again, lift it all the way up to disengage the ratchet mechanism, then push it back down. At first glance, the Oyster looked to me like a finger-pinching device with some kind of a mouse attached to it. I just couldn’t – and to some extent, still can’t – get over the idea that those jaws are going to close on my fingers one day. Objectively, this fear is mostly groundless. It takes tremendous force to close the mouse without deliberately disengaging the gear first (it will also break the mouse). Hence, this is unlikely to happen by accident. The only way your fingers are going to get pinched is if you lift the Oyster all the way up to the disengaged position, then bring it down with skin in the way. If you’re this determined to harm yourself, the Oyster mouse is probably a poor choice – but you may also want to avoid scissors, staplers, stairs, etc. Note the two scroll wheels, which are associated with separate primary “buttons” (actually ends of the same button) for ambidextrous use. In the old days, we were all solemnly advised to buy two ergonomic mice – one for each hand – so as to balance the load. And this was a great plan – particularly if you owned shares in a company that made ergonomic mice. Today, mouse manufacturers are looking for ways to accommodate alternating hands without doubling the expense. 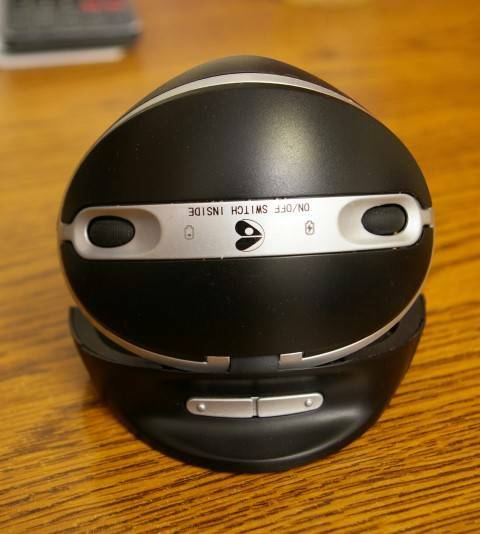 The Penguin mouse and DXT mouse are notable examples of this trend. The Oyster has its own unique way of accommodating both left and right hands. It actually has two sets of buttons and two scroll wheels, so the mouse literally cannot be positioned backwards. The user needs only to activate the desired hand mode by toggling a little switch on the bottom of the unit. The alternate buttons are disabled while inactive, and the scroll wheels are physically inset so as not to interfere with holding the mouse. For those with really large hands, the Oyster also comes in an up-sized version. My hands are fairly sizable, however, and I found the standard size to be big if anything. So caution might be advised if you feel inclined to choose the giant variety. On certain cars, the default lock settings force the passenger to manually unlock the door in order to exit. This gets old in a hurry. So does a mouse that you have to click, rather than just move, in order to wake it up. Unfortunately, some wireless mice work just this way, and the Oyster is one of them. I’m sure this “feature” helps the battery life – which is at least a week for me, by the way – but that hardly makes it less annoying when my somnolent mouse is snoozing on top of something I really don’t want to click! Even without counting its extra set of primary buttons, the Oyster has plenty to go around. There are six total, but the top two “thumb” buttons are dedicated to the same function – double-click (spelled variously as dubble click and dubbel click in the manual, which could use some additional translation from Swedish I think). The two bottom rim buttons, accessible only by your pinkie (and hardly so) correspond to copy and paste. The manual goofs more seriously on this one, identifying the buttons in reverse of their real functions. As far as I can tell, there’s no special driver and therefore no easy way to reassign the Oyster buttons. Here, the Oyster mouse is shown on the first notch up. When you push down to click the Oyster, there is no satisfying fresh-carrot snap like the one you get with, for example, the Contour mouse. The button action and construction quality, in fact, are pretty much indistinguishable from any garden-variety standard mouse. Only the shape is obviously different, and because of that shape – with moving parts between the mouse and the base – the Oyster tends to creak and sway a bit sometimes. Not super-annoying, but not super-solid either. The mouse wheel center-click on the Oyster is unusually hard to actuate. This wouldn’t be a big deal for many users, but as a major fan of tabs in Firefox, I use center-click a lot. With the Oyster, I find myself resorting to ctrl-click more often to achieve the same effect without the hard center-clicking action. Mousing precision is a topic frequently covered on this blog. Most ergonomic mice, sad to say, are profoundly lacking in this quality due to intentional trade-offs of functionality for advertised health benefits. The Oyster design is not in this group, but still disappointed me a little in the area of precise movement. I don’t notice any lack of precision normally, but it makes a sudden appearance when I’m performing certain tasks. One example is navigating through some types of nested menus. With the Oyster, I’ve sometimes found my targeting just off enough to lose focus and let the menu collapse. Again, this problem only manifests itself occasionally. I think it’s something the average user could live with, and might not even notice. For a vertical mouse, the Oyster has quite a horizontal footprint. Its base plate is a full three-and-a-half inches broad. All of this width is certainly needed in order to maintain stability in the different possible positions, but it can create some issues if the mouse is positioned near the edge of the keyboard. I currently use a Kinesis Freestyle keyboard with a small split between the halves, and frequently find that the Oyster is impinging on its eastern frontier. With a narrower keyboard such as the Truly Ergonomic, this likely wouldn’t prove an issue. A priceless pearl, or an empty clamshell? The Oyster is a new product, and we can hope to see some of the aforementioned issues addressed in future versions. But even with all the minor problems intact, I could live with the Oyster as my forever ergonomic mouse if necessary. It’s comfortable for me to use in the vertical position, and handily ambidextrous for the times when my right hand is feeling poorly. For other users, the flexibility of tilt levels offers a degree of personal customization not found in most ergonomic mice. I’m looking forward to watching where this product, and this company, will go in the future. Disclosure: This review was made with a complimentary sample from the US distributor for the Oyster mouse. switch to ergo products has completely eliminated any pain or discomfort despite decades of crazy hours behind screens. I hope you too weave in a bit of ergo into your lives. AllThingsErgo.com independently reviews ergonomic products and does not receive any financial compensation from manufacturers other than free or reduced price samples. AllThingsErgo.com participates in the Amazon Services LLC Associates Program, an affiliate advertising program designed to provide a means for sites to earn advertising fees by advertising and linking to amazon.com.